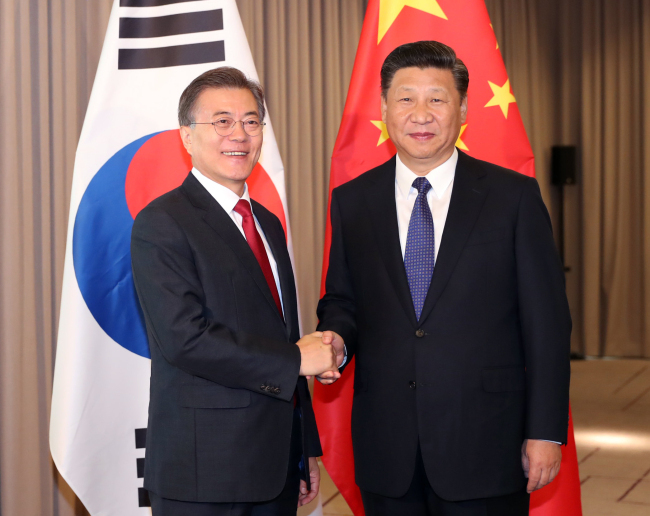 President Moon Jae-in proposed a trilateral discussion with the US during a summit with Chinese President Xi Jinping last month in a bid to ease Beijing’s resistance to the deployment of a US missile shield here, Seoul officials said Wednesday. The two leaders held their first face-to-face talks ahead of the Group of 20 summit on July 6 in Berlin. Moon called for his counterpart to retract China’s economic retaliation over the stationing of the Terminal High Altitude Area Defense system, while Xi argued Seoul needs to “eliminate an obstacle” and respect Beijing’s “core interests” in order to improve ties, referring to THAAD. Defending the assets as purely intended to counter North Korean threats and not to keep China in check, Moon suggested forming a joint panel to verify the system’s technical functions and holding a three-way dialogue involving the US to discuss the matter. But Xi did not immediately respond and Beijing has since remained quiet on the offer, officials here said. Cheong Wa Dae declined to confirm the discussion, saying it is “inappropriate” to release specifics of summits. But it denied a news report that Chung Eui-yong, chief of the presidential National Security Office, visited Beijing to confer on the offer, a future summit and other bilateral issues. Though the Xi government has expressed its resolve to recover bilateral relations since Moon took office in May, its economic retaliation and diplomatic pushback have shown few signs of abating. Beijing renewed its protest after Seoul decided to install four THAAD launchers, which had been initially deferred due to an environmental review, in response to Pyongyang’s latest test of an intercontinental ballistic missile last month. Seoul officials acknowledged the proposal was unlikely to materialize, especially with Beijing gearing up for a critical party congress in the fall, which would unveil a cadre of next-generation leaders and provide a key indicator of how solid Xi’s leadership is. “Even if China does not take it, it may be necessary for us to make the offer to display our new administration’s willingness to be open to the issue and resolve the spat,” an official told The Korea Herald, requesting anonymity due to the sensitivity of the subject.